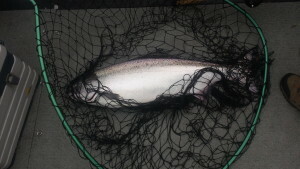 The first springers of the season have been taken in the past few weeks from tidewater up river over 20 miles. But this is just the beginning. From now through early June these big, hard fighting fish will be pouring into the Rogue. The peak of the run will be from mid April to mid May. I fish this run out of a covered, heated boat so even if it”s wet or cool, we can keep comfortable. For those unlucky anglers that didn’t make it up to the Rogue last summer, you missed out! We had what most people called the best fishing in the last 15-20 years. From late July until late September the fish just kept coming. As usual, my best fishing was from mid August until mid September but most of the season was excellent! Another good run is projected for this coming season. If you couldn’t make it last year be sure to give me a call and come fishing in 2018. Posted on March 18, 2018 Author Ron SmithLeave a comment on Springers Have Arrived!! Big, bright chinook salmon will begin streaming into the Rogue River within the next month. These hard fighting fish average around 20# with a few up to 40#! The action continues through September with the peak from mid August thru mid September. 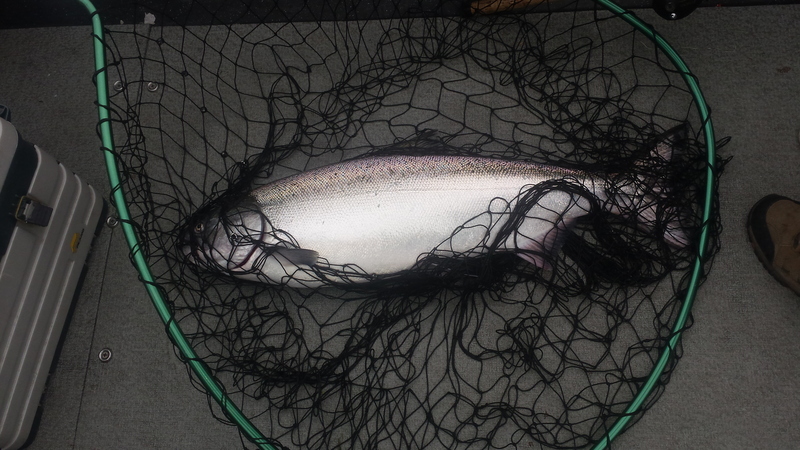 In mid August the Coquille River, just north of the Rogue, begins to get it’s run of these beautiful fish. Plan your trip soon as it starts to get very busy in the next few weeks. On a related note, the ocean salmon fishing off southern Oregon is closed this summer to protect the Klamath River and Sacramento River fish that make their way down our coastline. All the rivers and bays in southern Oregon are open for fishing as usual. In fact, the ocean closure should make the river fishing better since no salmon will be harvested before they enter their home river. Tight Lines in ’17!! 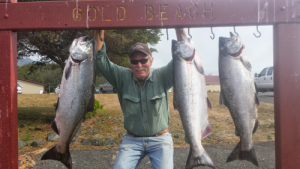 Posted on June 15, 2017 Author Ron SmithLeave a comment on Tidewater Chinook Season Just Around The Corner!!! The first spring salmon should be entering the Rogue River within the next couple of weeks. By late March there are usually enough fish in the river to make it worth a concerted effort. I will begin guiding for springers the first week of April and continue into May. How long into May depends on numbers of fish and river conditions. With all the rain and snow pack this year, there should be plenty of water and good conditions through the season. After springers, I head to Alaska to guide a few weeks during the peak of the Nushagak River chinook run and then back to Gold Beach for bay fishing by late July-September. Last summer was very good fishing most weeks in the bay and I’m expecting another good year in 2017. Call if you’d like to join me on the Rogue or even in Alaska (541-425-1318). Posted on February 28, 2017 February 28, 2017 Author Ron SmithLeave a comment on Springer Season is Fast Approaching! Posted on August 19, 2016 August 19, 2016 Author Ron SmithLeave a comment on Rogue Bay Fishing Is Heating Up!! Big bright winter fish have been pouring into the Rogue since early December. High water recently has kept anglers from harvesting them but when the rains subside it should be great fishing again. I have several dates open the last week of January so give me a call if you can make it. Don’t forget, springer season is fast approaching! The first fish are usually caught in late February with good numbers appearing by late March. With this winter’s abundant rainfall and snow in the mountains, the fishing should continue strong through May. Just call 541-425-1318 to schedule a trip. Posted on January 18, 2016 Author Ron SmithLeave a comment on Winter Steelhead Bonanza! Alaska Kings on the Nushagak River! I just returned from guiding on the Nushagak River near Dillingham, Alaska. If you want to catch a lot of kings (chinook) in a remote setting, this is a great place to do it! If you are interested in joining me there in 2016, let me know. Now I’m gearing up to fish the Rogue River near Gold Beach, Oregon. Conditions are lining up to make this another great year for catching bright, hard fighting kings in tidewater. These silver bullets average close to 20# and every year I have fish around 40# caught by some lucky angler(s)! Join me this summer by calling and booking a trip. Posted on July 9, 2015 Author Ron SmithLeave a comment on Alaska Kings on the Nushagak River! 70,000 Rogue Chinook on the Way!! According to the Oregon Dept. of Fish and Game, a predicted 70K summer/fall chinook will make their way back to the Rogue in 2015. Those fish will start coming into the Rogue bay in July and will still be coming in October. Call now to get a chance to land one of these big, bright fish! Posted on May 20, 2015 Author Ron SmithLeave a comment on 70,000 Rogue Chinook on the Way! !